We pride ourselves on stocking an exclusive range of traditional clocking cards and accessories for most models of time recording clocks and staff clocking on machines. 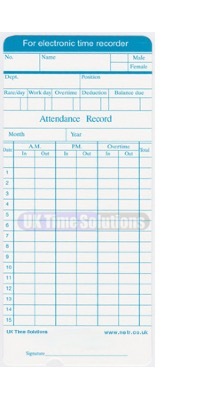 Our stock holding of time clocks and cards include weekly use clocking in cards, monthly timecards, barcoded Seiko clocking on cards, job timing cards & engineers job tickets, time and attendance key-fobs and swipe cards, technician PCT/1 job sheets and much more. All cards and accessories are available for fast next day delivery.